Wire shelving is one of the most common materials-handling solutions and is used in virtually every type of business and even in residential homes. From storing parts, such as those in an automotive shop or a tool room, to storing plates and linens in a restaurant to storing company files and documents, wire shelving is everywhere. 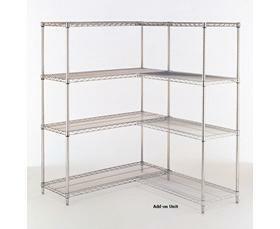 The S. W. Betz Company offers wire shelving with a number of different dimensions, capacities, and finishes. The type of finish can be important if you are in a medical/pharmaceutical or a wash-down area or need an anti-rust finish. Finishes available include chrome, black epoxy, galvanized, stainless steel, and others. One of the main advantages of wire shelving is that it is highly customizable, and the shelves can even be adjusted to make the spaces larger or smaller. Some of the different wire shelving that is available is listed below. The S. W. Betz Company is a distributor for some of the top wire shelving manufacturers in the industry, including Quantum Storage Systems, Nexel Industries, Inc., and Eagle Group, Inc. If you are in need of or would like more information on any of our wire shelving systems, please contact us and one of our team members will be happy to assist you. For more information about Wire Shelving or any other product or service from S.W. Betz, fill out and submit the form to the right.